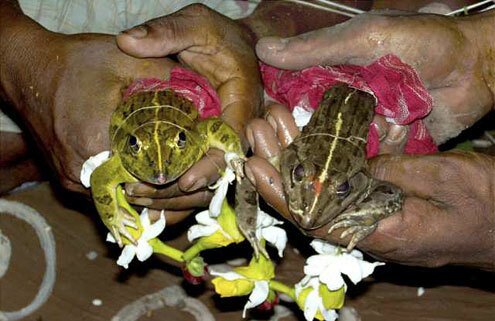 Agartala/Guwahati, Apr 18 : In a ritual to appease the rain god, villagers in Tripura and Assam married off frogs hoping that it would end their sufferings arising out of a protracted dry spell in India's northeastern region. Frog weddings are traditionally performed in northeastern India during drought-like situations before the onset of monsoon. "It is believed that the rain god is pleased when a frog wedding is performed. Since there has been no rain for the past couple of months, we have conducted a frog wedding to appease 'Barun Devata' (rain god)," said Sandhya Chakraborty, a resident of Fatikroy village, 115 km north of here. "We are confident that it would rain very soon to end our distress," she added. Hundreds of people at Fatikroy and Indira Colony villages in northern Tripura attended the unusual wedding ceremony of two frogs Monday night. Two groups of women separately bathed the frogs, a male and a female, and then they were dressed in new clothes for the wedding. The female frog was even made to wear a handmade necklace. The ritual was conducted by a Hindu priest according to tradition. "After the marriage, people walked in a procession singing traditional songs. The frogs were then freed into the Manu river," said Sikha Sarkar, who arranged the wedding. "We have learnt the ritual from our forefathers," Sarkar said. Although the frog wedding took place in the night, the preparations for it began since the morning. A mass feast was organised and people enjoyed local folk dances and music like Dhamail the entire night. Frog weddings were also reported from northern and eastern parts of Assam and various parts of Tripura. "Our region is mostly parched. We do not know what else to do. We hope that now the rains would start and people would be able to start farming," said Somesh Bhattacharjee, a priest who performed a frog wedding at Chipoha village in eastern Assam. Cultivation of tea, rubber, paddy and other crops has been severely affected due to the dry spell in the northeastern India. Besides farming, generation of electricity at the hydro-electric power plants has also been affected as water levels have come down considerably in the reservoirs of all major projects in the region. "The power-starved northeastern region has been hit by a severe electricity crisis since the beginning of March due to the dry spell," Tripura's Power Minister Manik Dey said. "Most of the hydel power plants in the region have either stopped or reduced generation due to severe shortage of water in their reservoirs. Gas and coal-based power projects have also sharply reduced electricity generation due to various reasons," he added. The weather department said the ongoing dry spell during the pre-monsoon period (March-May) is an unusual phenomenon. There has been 60-70 percent deficit in rainfall in the northeastern region so far. However, rainfall is almost normal in Arunachal Pradesh. "Rains are likely in the next couple of days. The shortfall is expected to be compensated before the onset of monsoon in June," Dilip Saha, director of the Meteorological Department here, said.